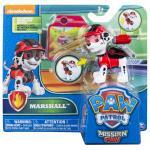 Mission Paw themed Marshall is ready for a rescue with his transforming Pup Pack! Just press the badge on Marshall’s uniform to transform it and save the day! Marshall comes in his special Mission Paw themed uniform. When the job is done and it’s time to pack up, the Pup Pack easily resets. This set includes an Animated Mission Card to outline your next rescue. The Animated Mission Card works with the Mission Pup Pad (sold separately). Need some Paw Patrol help from the gang? Collect all of the Mission Paw Pups to help out with the rescue! 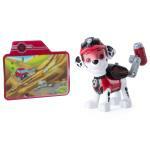 Bring home Hero Pup Mission Paw Marshall and re-create all of your favorite rescues from the show! No job is too big, no pup is too small! Hero Pup Mission Paw Marshall makes an impressive transformation as his Pup Pack transforms to save the day! 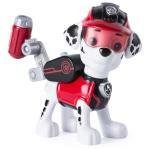 The Hero Pup figures feature all of your favorite transforming Action Pack Pups in Mission Paw themed uniforms. Collect all of the Hero Pup Mission Paw pups and work together as a team! Each sold separately. Mission Paw Figures are for ages 3+. No batteries required.